Our culture does not always teach us how to deal with anger in healthy ways. We are expected to be nice and polite and to act like everything is fine, even when it is not. We can hold our anger in, deny it and pretend it doesn’t exist, but that doesn’t make it go away. If we do not acknowledge our anger and treat it like the useful tool it is, then we run the risk of our anger exploding outward in destructive ways or staying inside of us and poisoning our spirits. Anger is a normal human emotion, and as was stated by feminist theologian, Beverly Harrison, in this morning’s reading, it is best understood as a simple feeling-signal that all is not well. If we are angry, it also means we care. We don’t often get really angry about things that don’t matter much. Maybe we get irritated at minor things, a slow car in front of us on the freeway, a houseguest that leaves dirty dishes in the sink for us to deal with, but unless we allow it to build, those types of irritations do not turn into rage. Anger is a normal emotion, but it can also be complicated. It is not always clear what is making us angry; we just know that something does not feel right. Maybe something seems unfair, maybe we feel disrespected or ignored, or perhaps we feel betrayed. Underneath our anger there is often another emotion; sometimes it is hurt, disappointment, or fear. You ask someone not to do something and they do it anyway. Someone does something that creates a situation that feels dangerous to you. A precious object is broken and cannot be repaired. Sometimes we are angry with others. Sometimes we are angry with ourselves. Sometimes we are angry with God. Anger is energy – it doesn’t just go away. We need to do something with that energy and the choice of what to do with it is ours. All of us carry pain, sometimes from our childhoods and sometimes from experiences we have had as adults. Sometimes in order to bury the pain we wrap it in anger, in resentment. It can be like carrying a time bomb around inside. If the wrong thing happens, maybe even if someone says the wrong thing in all innocence, it can be a trigger that can make the bomb explode. This is what I think happens in cases of road rage. Let me give another example, a fairly easy one to understand. Perhaps when you were younger, a dog bit you, or at least scared you badly. As a result, you are now afraid of dogs. Many years later maybe you go hiking in an area where dogs are not allowed. Then suddenly you see a dog running loose, the owner close behind. You might very well want to scream at the owner. You might even do it. How dare they have a dog here! But if you weren’t really afraid of dogs, if you hadn’t had that earlier experience, you might be irritated that someone was breaking the rules. You might even comment that the dog should not be there. Chances are, however, that you would not be particularly afraid and it would be very unlikely that you would start screaming angrily at the dog’s owner. Fear and anger can be an explosive combination. 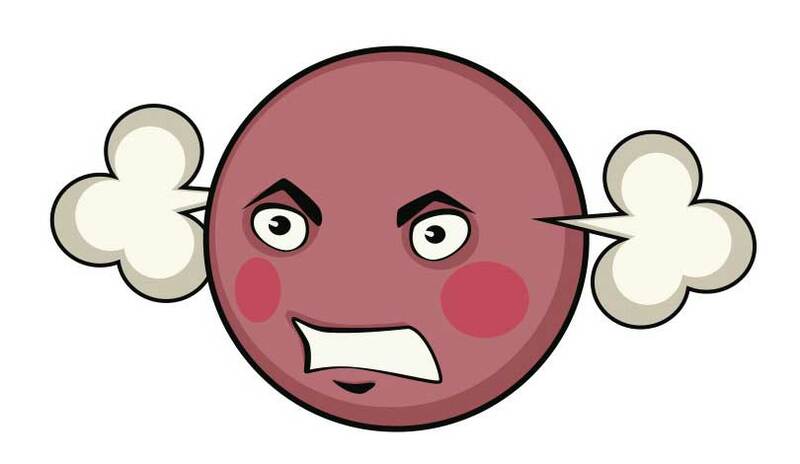 How can we learn to manage anger in healthy ways? Step one, I think is to simply acknowledge that we are angry. It is nothing to be ashamed of. As I said, it is a normal human emotion, something that tells us that something is wrong. Step two would be to try and understand what you are angry about. This is where counting to ten can help. Taking a few breaths, pausing before you react to your angry feelings doesn’t make the anger go away, but it gives you a moment to think. It might help now to be thinking about a time when you have felt angry. Maybe you want to think about a time when you have been furious, maybe even “blind with rage.” If you don’t want to go there right now, and that is OK, just think of a time when you have been seriously irritated. What made you so angry? What were you feeling? Our bodies usually produce adrenalin when we experience anger – the old flight or fight response of our brains that are programmed for survival. What was the immediate cause of your angry reaction? Did it remind you of anything else? Was your anger deeper and stronger than seems justified by the particular event? Two examples: Sometimes when I am working on the computer, and having a hard time either writing a sermon or composing a sensitive email, I can get irritated if I am interrupted. I have even been known to speak too sharply to my lovely wife when she asks me about the shopping list. It is clear that my reaction is all about me and is not at all a fair response to anything she did. It’s kind of like the old line about having a bad day at work and going home and kicking your dog. That was an example of misplaced or misdirected anger, and if we take a minute to think before we speak, we can avoid hurting someone else’s feelings. Sometimes our anger is directed correctly, however, but is much more intense that the particular situation calls for. The second example: your teenager’s room is filthy, as usual. You have calmly asked her to clean it up every day for the last week, but it hasn’t happened. Then she asks to go to the movies with a friend, and you explode and yell that she is not leaving the house until her room is clean. Ever been there? After you explode, you realize that you let your anger build up to a point where you could no longer contain it. A better plan would have been to tell her earlier in the week that you were getting angry because her room was still a mess, and that she needed to clean it before she does anything fun. Step three for managing anger, is figuring out what to do with it. No worries, there are only three steps. One: acknowledge it. Two: understand it. Three: do something with it. Once we realize that we are angry and know why, only then we can know what we should do about it. If you don’t acknowledge that you are angry, even to yourself, your anger festers inside of you. It becomes easy to turn the anger against yourself. There must be something wrong with me for feeling this way. Anger is energy, and it will find somewhere to go. If there is too much social pressure to be polite and to not be angry, our anger will either make us sick or come out in other ways. How many of you have experienced passive aggressive behavior from others? How many of you have practiced it? People often resort to passive aggressive behavior like saying something nasty with a smile, giving a backhanded compliment, asking a not-so-innocent question. People do that when they don’t want to acknowledge even to themselves that they are angry or because they are afraid of the consequences of expressing their anger. I didn’t mean it that way. It’s OK. I am fine. And then there is malicious compliance. Oh, I was just doing what you said you wanted. Sometimes passive aggressive behavior and malicious compliance are simply coping mechanisms when the angry person feels powerless. It is much better, if you can admit that you are angry and you can understand why, to express that anger in a direct and appropriate way. Using “I” statements is much better than the accusatory “you.” It is more effective to say, “I am angry” than “you made me angry”, because it is less likely to trigger a defensive reaction. It is also more effective if you can articulate why you are angry, and include at least some of reasons that your anger may be more intense than expected. “It makes me angry when it seems like you aren’t listening to me. It really upsets me a lot partly because my mother never listened to me when I was a child.” Expressing anger in that way is very positive. It can create changed behavior and increase mutual understanding. “Where anger arises, the energy to act is present. . . I don’t get really angry with individuals very often, but I am simply furious about much of what is going on in our world and our country. I am outraged at the increasing income disparity between the rich and the poor and that people can work full time and not earn enough to survive. I am furious that our politicians have put their votes up for sale and that corporations have been allowed to buy our democratic institutions. I am angry about what we are doing to our planet. I am angry that the police have killed so many unarmed young black men. I am angry that there have been so few prosecutions of those crimes. It fills me with rage when I think of all the young people who commit suicide, particularly our transgender youth. I could go on. Homelessness? I am old enough to remember the years before Ronald Reagan cut the federal housing budget and closed the state mental hospitals. Those were years when there were very few people without a place to live. Health care? Too many people still don’t have health care that is both affordable and decent. I could go on, there are so many things that merit our anger and our rage. My solution to my own feelings of anger is to write, agitate, and OK yeah, preach about it. “Don’t mourn, organize,” is good advice for all of us. Our anger can be good if we own it, understand it, and use it wisely. My prayer is that we will not use our righteous rage against ourselves or against innocent bystanders. My hope is that even when our eyes flash in anger, behind them is the light of love. The warmth of compassion that lives in our hearts can help us understand that we all suffer from structures of oppression and habits of mistrust that surround us. Something is wrong, many things are wrong, our anger should provide the energy we will need to bring more love and justice into the world. We can go on if we take each other’s hand and move forward in love and in hope. May it be so. What made you so angry? What were you feeling? Our bodies usually produce adrenalin when we experience anger – the old flight or fight response of our brains that are programmed for survival. What was the immediate cause of your angry reaction? Did it remind you of anything else? Was your anger deeper and stronger than seems justified by the particular event? People often resort to passive aggressive behavior like saying something nasty with a smile, giving a backhanded compliment, asking a not-so-innocent question. People do that when they don’t want to acknowledge even to themselves that they are angry or because they are afraid of the consequences of expressing their anger. I didn’t mean it that way. It’s OK. I am fine. Sometimes passive aggressive behavior and malicious compliance are simply coping mechanism when the angry person feels powerless. “It makes me angry when you don’t listen to me. It upsets me a lot because my mother never listened to me when I was a child.” Expressing anger in that way is very positive. It can create changed behavior and increase mutual understanding. I don’t get really angry with individuals very often, but I am simply furious about much of what is going on in our world, our country, and our state. I am outraged at the increasing income disparity between the rich and the poor and that people can work full time and not earn enough to survive. I am furious that our politicians have put their votes up for sale and that corporations have been allowed to buy our democratic institutions. I am angry about what we are doing to our planet. I am appalled that our state attorney general has told judges not to process the adoptions for married same gender couples. That particular one makes me even angrier because it feels personal. I remember the relief I felt when Anne and I were able to legally adopt each other’s biological children when they were young. How dare a state that pretends to care about children deny a child the right to a legal relationship with both of their loving parents? My solution to such anger is to write, agitate, and OK yeah, preach about it. “Don’t mourn, organize,” is good advice for all of us. Our anger can be good if we own it, understand it, and use it wisely. My prayer is that we will not use our righteous rage against ourselves or against the innocent. Our closing hymn this morning “My life goes on in endless song,” was written during the McCarthy era, the Red Scare, when many lost their jobs or were imprisoned because they would not betray their friends. The energy of anger is shining in the words of that song, but there is also love, hope, and faith. Together they create the melody.